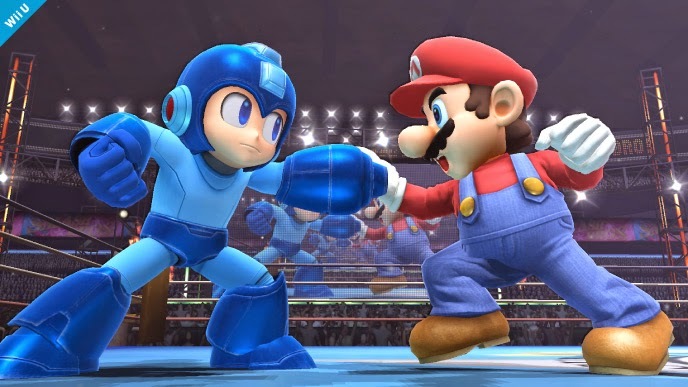 Rockman Corner: New Nintendo Direct to Focus on Super Smash Bros. I never liked this game and previous games about Super Smash Bros at all. I dont know why.. I tried it and immediately I found it so bored in the past. Not interested. People, please dont say.. what ? are you crazy ? Blah blah. No. We are all different and different taste. I just dont liked it, alright. Now, all I care about is Rockman and this is the reason I will take it as collection, thats it. Everyone has his own tastes. Personally I consider SSBB one of the best games for Wii, so I'm looking forward to it, but I never cared much for other popular series like Tekken and Soul Calibur. You are entitled to your opinion, though we are free to disagree with it. I am not a fighting game person myself, but this is the only game in the genre that I really like. Not because it's popular (I hate Street Fighter and thats popular), but only because it features a lot of my favorite characters in one game. This game is going to be great, but again, you are entitled to your opinion. Great ? Are you really kidding ?! Absolutely not! Yeah, you are entitled to your opinion. But you are not entitled to your own fact, snowlioness castillero. I found SSBB game rather boring! So because one person found SSBB boring, it is a genuine fact that the game is boring for everyone, and the people who actually enjoyed it are not entitled to that opinion of their's? The hell with SSB IMO. Long live Street Fighter. BTW people shouldn't lump those two series in the same category, unsuspecting others that haven't played both might think they are in the same group. WHICH IS NOT TRUE! SF is a fighting game, Smash is what happens when you put Mario, Link and Pikachu in the same game, which is automatic popularity and every fanboy on the planet white-knighting its every cause which makes it widely excepted in any case despite any contradictions. You don't understand, do you ? It is not for everyone, silly. Why did you said "everyone" ? Never mind. Just move on. @April 6, 2014 at 6:26 AM Anon: Then I guess that means any proper crossover game isn't a fighting game, meaning Marvel vs Capcom, Tatsunoko versus Capcom, Street fighter x Tekken and Injustice are not fighters. Thanks for the update, I'll be sure to tell EVO this news. @Anon: WOW your reading comprehension is so strong. Cause of justification =/ state of being. Let me put it this way. IF Marvel vs Capcom, Tatsunoko vs Capcom, Street fighter x Tekken and Injustice had the rabid gaming fanbase of Pokemon, Zelda and S.Mario with the gameplay of Smash and the creators themselves saying HEY its not a fighting game, and doing everything possible from having it played competitively at a high level, you'd be hard pressed trying to convince that fanbase otherwise if they wanted it to be a super competitive fighting game, despite logic or reason. Cause that's what fanboys do shove their stuff in everyone's face and lack logic or reason. It is a fighting game though. Mario vs Link vs Pikachu vs Kirby knocking each other off platforms while using various weaponry to see who's the last standing. Sorry Nintendo, your game is a fighting game. Here's the thing tho, while Mario vs Link vs Pikachu vs Kirby knocking each other off platforms while dealing with random items and stage hazards is the the main point of Smash and is encouraged, four player brawler modes with stage gimmicks and other related things if they are even present in a fighting game is left up to side modes and is generally discouraged in competitive play. Fighting games at their core are competitive games. Even Smash has to conform the best it can to the fighting game format in order for it to be competitively viable. If you watch any smash tourney or instance relating it to a fighting game you see that they lock items, pick the most stable stages, and generally play 1v1 as the main draw with the occasional side 2v2. In some cases they mod the freakin game engine to make it viably competitive THAT'S HOW FAR THEY GO. True, but considering this is the original Mega Man, it will likely be a classic series stage. I wonder if it will be the Wily Star, with Dark Moon replacing the Yellow Devil as a gimmick. It's kind of a shame that third-party franchises only get one playable character. I would've really liked for Proto Man, Bass, and Duo to have been added. Because then Sega would have to have an equivalent amount. Which means Sonic would get three more, and any others would need three more as well. Which means less time developing Nintendo characters which is a huge no no to the rather large core fanbase. It would also means 3rd parties would have more reps than series such as Fire Emblem, Metroid, F-Zero, Mother. People would lose their minds. This is true. Good explanation. It wouldn't be an issue to have a bunch of characters if this were a Capcom game, but it's not.Nintendo has their own fans to please as well. The Mega Man reveal trailer was pretty much the best thing in gaming I've ever seen. Personally speaking of course. I don't know what to expect from this direct, but everything else for me is just a bonus in my mind. Game looks like it's shaping up great, and I hope it delivers. Either way, I'm thankful to Nintendo. Smash Brothers needs a Team Fortress 2 character or two. No. Team fortress has never been on a Nintendo console and has no rights to a place in Smash. Thanks, Obvious Man. I'm just saying it's a dumb rule (along with all soul-less bureaucratic copyright red tape BS that keeps countless cool things from happening) and the game would benefit from their inclusion. How is it a "dumb rule"? Super Smash Bros. is and always has been, at its core, a celebration of Nintendo, its characters, and its history. Putting in Team Fortress 2 characters "just because they're cool" makes absolutely no sense. And no, the game would NOT benefit from their inclusion. It'd be a cluster****. No it is not a celebration of Nintendo characters. Smash is a video game like any other at its core. It using characters from other series is just a bonus. In fact way after the game design was laid out and the core programing was near completion the devs then decided to "celebrate" with already established Nintendo characters. Well clearly a brand name and it's history is more important to you than fun. Sad. I enjoy Smash because it's everything Nintendo and Nintendo's history. That's why I enjoy it, not because it's a random bunch of characters slapped together(See: Playstation All Stars). Team Fortress 2 would not contribute to that at all, especially since I feel they work best in their setting and not Smash's. Also remember Smash has a hard policy on real guns. They aren't allowed. Meaning almost every character from that game? Not happening. They'd be shells of themselves. "More important to you than fun"? Maybe adding in stupidly random characters that have no business being in the game at all isn't their idea of fun (and come to think of it, it isn't mine, either). Ever thought of that? Seriously, don't try to make Smash Bros. into something it isn't. Agree that Team Fortress characters don't fit, at all, but about the real guns policy... SNAKE! Snake used explosive weapons, not bullet based weapons. This is one of the dumbest suggestions I ever heard for new Smash Bros. characters. Sorry, this was in response to "Anonymous April 6, 2014 at 10:54 AM" and their suggestion for TF2 characters. Not gonna happen. It will never happen. They were never on a Nintendo console. Thanks, Obvious Orangutan. Christ, what's with all these dumb kids and their missing the point completely? "Hurr durr you dum dey nebur on nentendooo consoole so es stooped idae". Anonymous April 7, 2014 at 12:04 PM - Wow. so much anger in your post. you need to chill out bro.